Friends – if you did not get yesterday’s update regarding hundreds of birds falling dead in the Netherlands when a 5G test was taking place, please check it out here. They are planning to unleash these frequencies in six U.S. cities and people need to be aware. Heads up Atlanta, Chicago, Dallas, Houston, Los Angeles and Washington, DC. The time is at hand. Please protect yourselves. Fantastic website! Thank you for all for exposing RF truth. In regards to the response to the NTP results, with it added to thousands of other studies and evidence piling up for 60+ years, Will the US Government remain on track in 2018 for a national 5G wireless infrastructure in place by 2020? 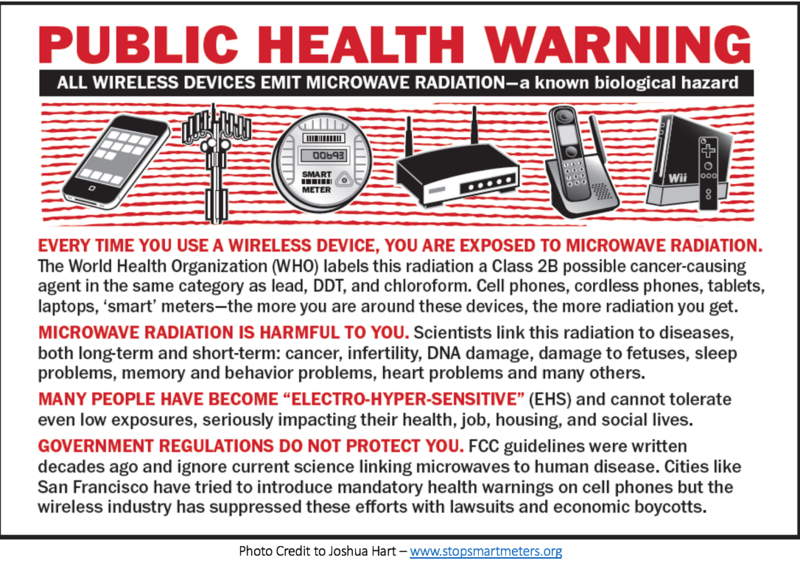 As I am sure all of you know the signs and symptoms associated with RF exposures reveal that the general population increasingly experience symptoms as are noted in microwave sickness/EHS. This is clearly a dose-response relationship directly related to density and an array of frequencies. The scientific peer-reviewed literature demonstrating the correlation between exposure to EMF / RF and thousands of health problems means the evidence is irrefutable. So its not a stretch to say its on track to eventually manifest in all members of the population with enough exposure and 5G deployment density is on schedule to seal that fate. Our government clearly plans to continue to misstate what is a common understanding on the health effects of microwave radiation to assist the telecommunications business in the radiation delivery business delivered to the population. Second hand invisible RF radiation density today is much more toxic then second hand cigarette smoke. Our federal Government consciously ignores 60+ years of research proving wireless devices/access points are toxic delivery devices. Just like cigarettes, the tactics used to deliver wireless carcinogens cause brain and central nervous system manipulation. And knowing RF radiation has been proven to cause physiological responses that means RF works like a drug, still government peddles all effects are psychosomatic. We all know today no federal agency is currently authorized to consider the health impacts of deployment and those criminal guidelines were set in 1996, We also have identified the FCC is staffed by former members of the telecommunications industry, but we must look much deeper. We know the Trump administration is on track in 2018 for a national 5G wireless infrastructure in place by 2020. The people are being told it must be done to counter China’s position in global technology markets, despite the dangers of this technology not only for human health but the human genome, it remains full steam ahead. We know the reason being used to ignore what it will do to humanity, It’s the military AI market in China, because it’s expected to grow rapidly and that is credited to the incorporation of AI technology into warfare systems, advances in AI-based weapon technology, and modernization programs conducted by the defense forces of China. And it all requires a 5G infrastructure. But we must look deeper. The 5G plan for radiation density offers 24/7 police surveillance that sees through all walls, smart everything, driverless vehicles, mobile virtual reality, mobile augmented reality, connections capable of using the Neuralink brain implants etc., etc. All these features at the Federal, State and County levels are for government control of the masses without historical context. Since the 1990’s the FCC has remained unchallenged on every level and on schedule as America has also been forced into the next phase of agenda 21, and thats U.N. Agenda 2030. The 5G grid on earth and 20 thousand more satellites to saturate every square inch of earth in RF radiation is the final pieces and on schedule to be complete by 2025 for the 2030 goals. I think it is vitally important for the activists to include the who, what and why, directly behind the FCC and that is the DHS, CIA, DoD, DoT and more. Perhaps you can help me get this discussion launched anywhere? My attempt to get this discussion started on social media. Jeff – thank you for taking the time to share your wisdom here. I really appreciate it. We have to get you signed up in the google group called ” cell-tower@googlegroups.com.” Here you can begin a conversation with people that are also very concerned about this issue. They seem to be considerably more intelligent than the bulk of people on facebook (since facebook has kicked off anybody that has any real knowledge). Hopefully together, we can attempt to move forward and deal with this issue effectively. FYI – the FCC is being challenged at the moment with 6 lawsuits that have now been bundled into one. Read more here: https://www.theregister.co.uk/2018/11/07/fcc_5g_lawsuits_bundled/ . I presume the suits are being bundled so that the corrupt legal system can more quickly try to sweep this under the rug. But we can still hope for miracles. Regarding who is behind the FCC, this is very, very important. I would like to learn from you on this topic. However, I feel there are very few people who are really ready to go the bottom of the rabbit hole and see what and who is there. Those in the know know that Israel is in total control of DHS and the CIA at the moment. I am not sure about the DoD or DoT but I reckon it’s the same cult of evil that controls all of these alphabet agencies along with our “judicial” system. I think they’ve got it pretty much wrapped up in terms of attempting to lock our people and our planet down but I don’t think they will succeed. However, you are right. It is likely they are on track for making millions very sick. We have to rise together to stop these creatures from killing all life. I trust we will find a way. Is this all true in India this is a big debate now as we have new movie named Robo 2.0 with the same subject. Yes, I have heard of the movie. To my knowledge, everything on this site is true and correct.